For a homeless person, a pet is often their closest companion. Often, a pet will help them stay safe when they are sleeping rough, provides comfort and companionship, and many homeless people tell us that caring for their pet is what keeps them from being tempted by drugs or alcohol when they are at their lowest. But for a person on the street, caring for a pet and affording veterinary care can be an almost impossible task to go alone. One of the charities that is very close to our hearts, is Pets In The Park, a group of dedicated volunteer vets, vet nurses, and other volunteers who every month, help homeless people across Australia to care for their pets. As our way of helping the homeless to care for their pets, Paws for A Purpose has pledged to help fund the great work that Pets In The Park does across Australia. Inset photo: Our Dr Mark Kelman doing a free vet-check at Pets In The Park in Frankston, Melbourne. 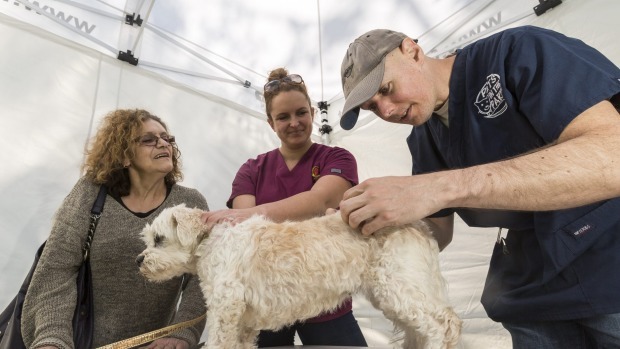 ​In 2012 Dr Mark Westman, Vicki Cawsey, Dr Leah Skelsey and Linda Warlond collectively realised there was an urgent need for a service dedicated to caring for the pets of those experiencing homelessness. The four co-founders united their passion, drive and determination to develop PITP and involve strategic partnerships with human service providers, including soup kitchens and outreach cafes, and a referral system working with social workers and case workers for people experiencing homelessness. This model was based on an outreach program started by Dr Mark Westman in Prince Alfred Park, Parramatta in 2009 when he took a fold out table and an esky of vaccinations and started free veterinary checks for homeless clients at a Stepping Stone Community soup kitchen in Prince Alfred Park. The concept quickly caught on with many volunteers offering to help this great cause. An official charity was formed and became incorporated, gaining full status including 'Deductible Gift Recipient' meaning that all donations to PITP are fully tax deductable. The issue of how to continue to get funding for essential groups like Pets In The Park, was one of the inspirations that gave birth to the idea of Paws for A Purpose. Since its early days, the reach of Pets In The Park has now grown with the group becoming a fully registered charity, and operating in 5 states of Australia (NSW, VIC, QLD, TAS & ACT) with 7 regions and still growing, due to the need of homeless people and those at risk of homelessness to get help, particularly veterinary assistance, in caring for their pets. As the charity moves into it’s 7th year and beyond, with a dedicated group of hundreds of volunteers and a number of directors now keeping this essential charity operating - it has no government funding, and is in need of financial help to be self-sustaining, particularly as it grows. Across Australia, Pets In The Park runs monthly free veterinary clinics for homeless people's pets, and for people at risk of homelessness. They also run desexing clinics where they perform surgical procedures at no cost, for these same pets. They also run outreach programs to get to people who are living rough but unable to make it to the regular clinics. Paws for A Purpose, from the profits generated from the sale of it’s quality products will contribute to the financial help that Pets In The Park needs to fund it’s administration and growth. You can find out more about Pets In The Park here. Header photo courtesy of Yvette Jones, Pets In The Park's Central Melbourne photographer and publisher of Dogs of Our World. Inset photo courtesy of The Age newspaper.